La Union Philippines, if you surf you need to visit! Nicknamed as the surfing capital of the Philippines, La Union is also known as the “Garden Coast” due to its bountiful botanical gardens. It was once one of the seedy R&R centers for the American Servicemen due to its proximity to the Wallace Air Station. Since the handing over of the American bases in 1991 to the Philippines Government, La Union Philippines is not as well known as a tourist destination, as its other more trendy areas. La Union simply did not stand out as much as Boracay, Puerto Galera or Palawan, even though it is blessed with a beautiful coastline and exquisite natural beauty. Lately though La Union has managed to return to prominence as one of the more favoured surfing breaks in the Philippines. In fact, it is only second to Siargao in Mindanao as the place to go if you are after consistently good surf. La Union Philippines history dates way back before the arrival of the Spanish in 1572. Way back then, it was a thriving port dealing with gold to the Chinese and Japanese merchants of that era. However, La Union as we know it now, actually came into being with the union of 9 Pangasinan towns, 3 Ilocos Sur towns and the surrounding villages of Pais Del Igorotes just below the foothills of western Cordilleras, following a decree by Queen Isabella of Spain in 1854. Surfing as a recreational activity in La Union province only started to become popular when foreigners began settling here, especially in the town of San Juan and Urbiztondo. It is said that an Australian Brian Landrigan, was the one who really made this sport popular in San Juan during the 80s. The son, Luke Landrigan, is also a talented surfer who had represented the Philippines at several international competitions. Today, the father and son team is running a resort called “San Juan Surf Resort”. 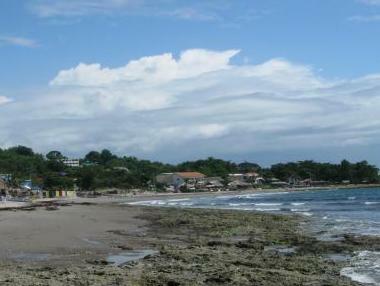 The town of San Juan is located approximately 4 hours from Manila by bus. Now, if you decid to hitchhike all the way from Manila, you would be stark raving mad! It might take you months to get there, if ever. Just take a bus. It hardly costs more than a bottle of good wine. At least you have the peace of mind of reaching your destination safely. To find out how to get to San Juan, La Union, check out our article on “Travel to La Union” . The dry season in La Union Philippines, starts around November and runs though to April. While the wet season runs from May to October. It is important to note that surfing in La Union, is not consistent all year round. The surfing here is seasonal as well. So if you want to time dry weather and good surf, then you need to be here during the months of November to March. But if you can’t make it during the dry season, there is another window of “surfing” opportunity. July to October, even though it is the official wet season, you still get sunny days, after all it is the tropics. La Union – Where do I stay? There are plenty of small resorts on the beach. The level of comfort will depend on how much money you want to part with. No surprises with that is there! If you plan to visit San Juan in La Union Philippines, ensure that you book your accommodation before hand. To find out more about the various types of accommodation available in San Juan, La Union, you can refer to our article “La Union Accommodation” . What Do You Think of La Union Philippines?